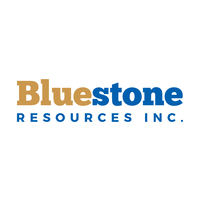 Bluestone Resources Inc. (TSXV: BSR) (OTCQB: BBSRF) is pleased to announce additional infill drill results from resource conversion drilling underway at its high-grade Cerro Blanco Gold project. The focus of the ongoing infill drill program is to upgrade the Inferred Resources into Measured and Indicated Resources. Bluestone recently announced results of a Feasibility Study on the high-grade Cerro Blanco Gold project (see press release January 29, 2019) where one of the principal recommendations for optimizing and further enhancing the project was through potential conversion of a portion of the 360,000 ounces of Inferred Resources to Measured and Indicated Resources through infill drilling (currently ongoing), which will be followed by an updated mineral resource and mine plan. Hole UGCB18-109 and UGCB18-110 were both drilled from the same underground platform at a positive angle (+35 and +51 degrees respectively). The principal objective of these holes was conversion or extension of veins VN_01, 02 and 03 from Inferred to Indicated Resources. UGCB18-109 intercepted all targeted veins as planned with VN_02 assaying 3.3 meters at 27.9 g/t. Hole UGCB18-110 intersected veins VN_02 and VN_03 with the former assaying 2.0 meters at 10 g/t Au (see table). Assay results listed within this release were performed by Inspectorate Laboratories, a division of Bureau Veritas, which are ISO 17025 accredited laboratories. Logging and sampling are undertaken on site at Cerro Blanco by Company personnel under a QA/QC protocol developed by Bluestone. Samples are transported in security-sealed bags to Inspectorate, Guatemala City, Guatemala, for sample preparation. Sample pulps are shipped to Inspectorate Laboratories in Vancouver, BC, Canada or Reno, NV, USA, and assayed using industry-standard assay techniques for gold and silver. Gold and silver were analyzed by a 30-gram charge with atomic absorption and/or gravimetric finish for values exceeding 5 g/t Au and 100 g/t Ag. Analytical accuracy and precision are monitored by the analysis of reagent blanks, reference material, and replicate samples. Quality control is further assured by Bluestone’s QA/QC program, which involves the insertion of blind certified reference materials (standards) and field duplicates into the sample stream to independently assess analytical precision and accuracy of each batch of samples as they are received from the laboratory. A selection of samples is submitted to ALS Chemex Laboratories in Vancouver for check analysis and additional quality control. Bluestone Resources is a mineral exploration and development company that is focused on advancing its 100%-owned Cerro Blanco Gold and Mita Geothermal projects located in Guatemala. A Feasibility Study on Cerro Blanco returned robust economics with a quick pay back. The average annual production is projected to be 146,000 ounces per year over the first three years of production with all-in sustaining costs of $579/oz (as defined per World Gold Council guidelines, less corporate general and administration costs).